An obvious difference between our Golcar Passivhaus and Denby Dale projects is that, at Golcar, we’ve gone for a warm ‘cathedral’ roof to create extra space in the attic area, as opposed to the cold roof we created for Denby Dale. You get the advantage of having the extra space and room but inevitably, a warm roof is the more expensive option, as it is a more complicated build. 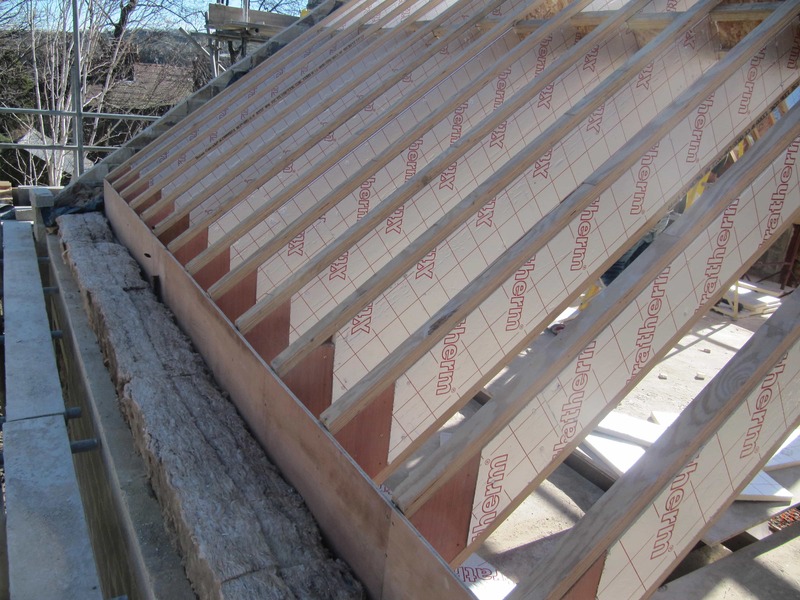 The cold roof strategy we used at Denby Dale which was a very economic way of achieving the continuity of insulation and airtightness needed and has been replicated at other Passivhaus projects as a cost-cutting measure. 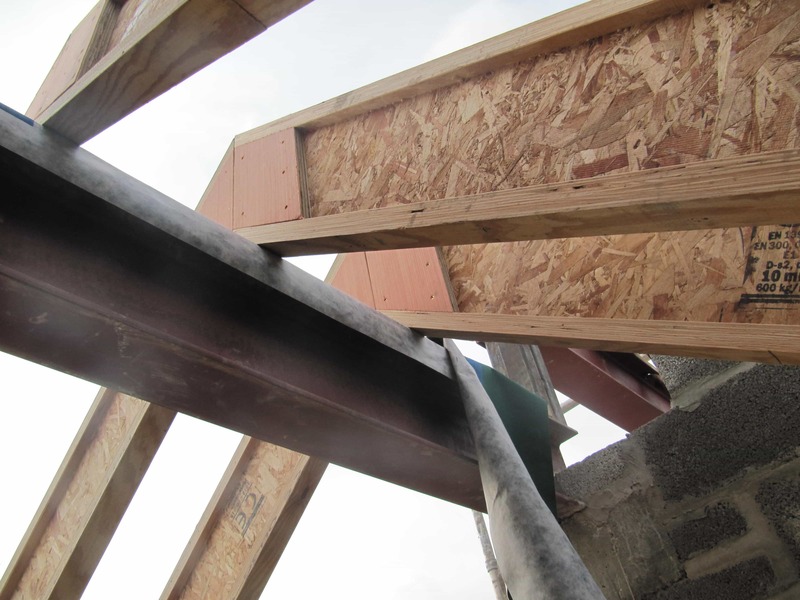 The roof detailing at the Golcar Passivhaus is in fact similar to that at our Stirley Farm EnerPHit project. We have used steel structural ridge purlins to carry the main load of building, which are inside the thermal envelope (so not creating a ‘thermal bridge’). We used a slightly smaller timber I-joists than we used at Stirley (in this case 302mm deep). We have improved our TJ joist detailing even from the recent Stirley Farm project by placing 25mm of polyurethane insulation in both sides of the web of the I-joist so it forms a neat ‘square’ unit. c) reduces air movement around the insulation and thermal bypass within the web of the I-joist. 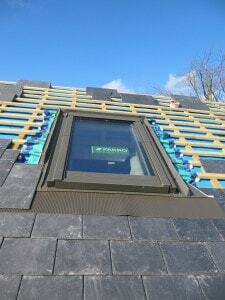 The roof needed to be windtight and vapour open on the outside and vapour closed/ airtight on the inside. In contrast to Stirley, where we used a wood fibre vapour open sarking board, in this instance we’ve used Solitex windtightness membrane because of the need for traditional detailing at eaves and verge (see more on aesthetics below). 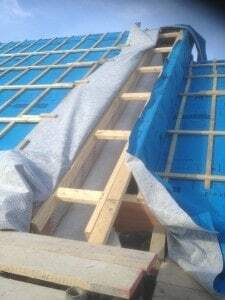 To further reduce the thermal bridging of the TJ joists we’ve used a continuous 50mm polyurethane insulation board on the internal slope, sandwhiching an Intello vapour barrier. Note: We’re not actually using the Intello to its fullest potential here- in theory it could have been replaced by plastic sheeting. We are not going to be able to utilise its ‘intelligence’ and vapour release properties because we’ve blocked it with the polyurethane. But we’ve used it here for buildability and robustness reasons and costs. This is not going to create problems with moisture/ condensation as we have a vapour open membrane on the outside, so moisture won’t be trapped in the roof. As a rule of thumb, if the vapour control layer is within the first third of the insulation there is no danger of interstitial condensation. The junction between the roof and the wall outside needed to fit in with the West Yorkshire vernacular. At Denby Dale we had a big overhang for shading which disguised the build up due to thickness of insulation within the roof, which gives the building a different look than the normal West Yorkshire vernacular. At Golcar we haven’t needed an overhang but we have had to create an extra ‘false’ roof with smaller rafters to cover the thickness of the walls otherwise it would have created an aesthetic problem. We have had to ensure continuity of insulation and airtightness between the two roof heights. To achieve this we’ve had to build timber ‘framing’ so that we have continuity of insulation, as well as airtightness & windtightness. 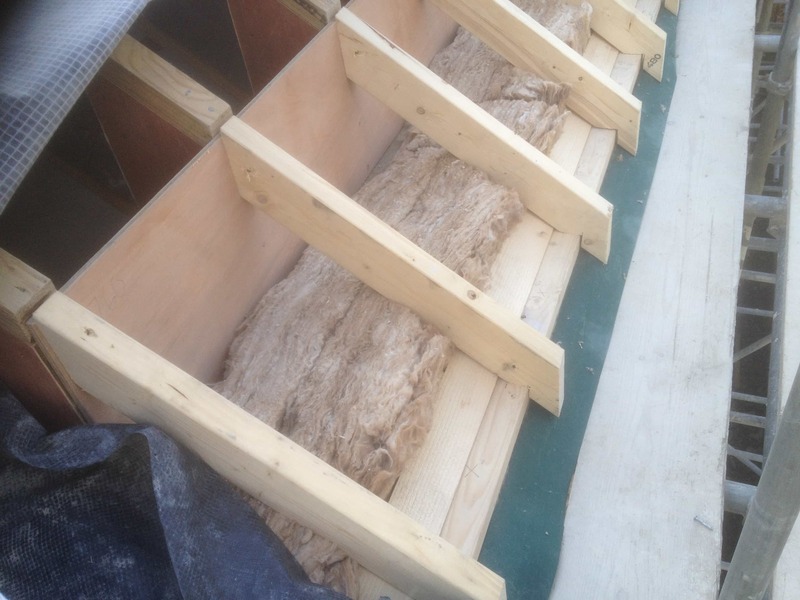 We’ve done a bit of cost benefit analysis on the roof- using PHPP – and we concluded that we did not need such a depth of insulation as we used in the Stirley Farm warm roof. 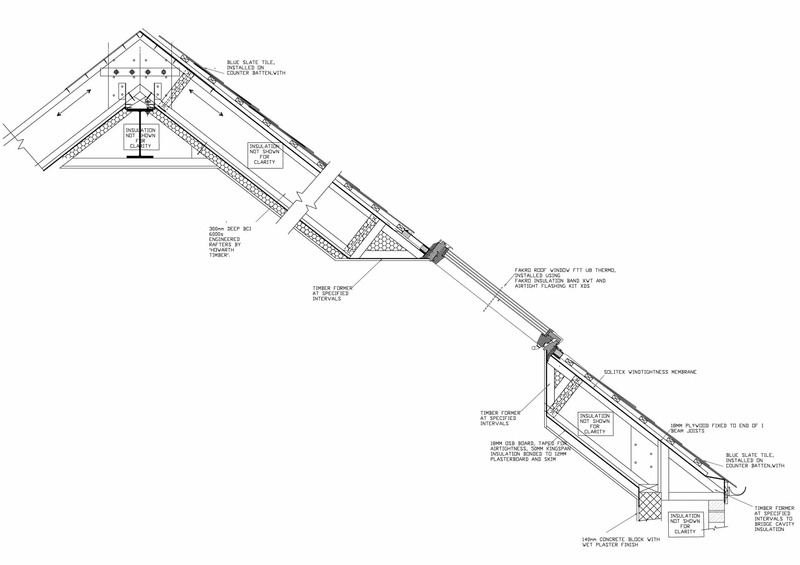 This time, we’re going for a 302mm depth I-beam in the roof as we didn’t need a 406mm I-beam – we didn’t need as good a U value as we needed at Stirley. That is the beauty of using PHPP to plan your project – taking your time and seeing what you can get away with. So we’ve got a lesser U value in the roof at the Golcar Passivhaus, but it still delivers the Passivhaus requirement of 15 kWh/m2/K. We are using 3 Fakro rooflights which are Passivhaus certified and quadruple glazed, with excellent whole window U values of 0.58 W/m2K. They also came with airtightness and windtightness skirts and insulated flashings, so they’ve really thought about how it would work within a Passivhaus/ low energy building. 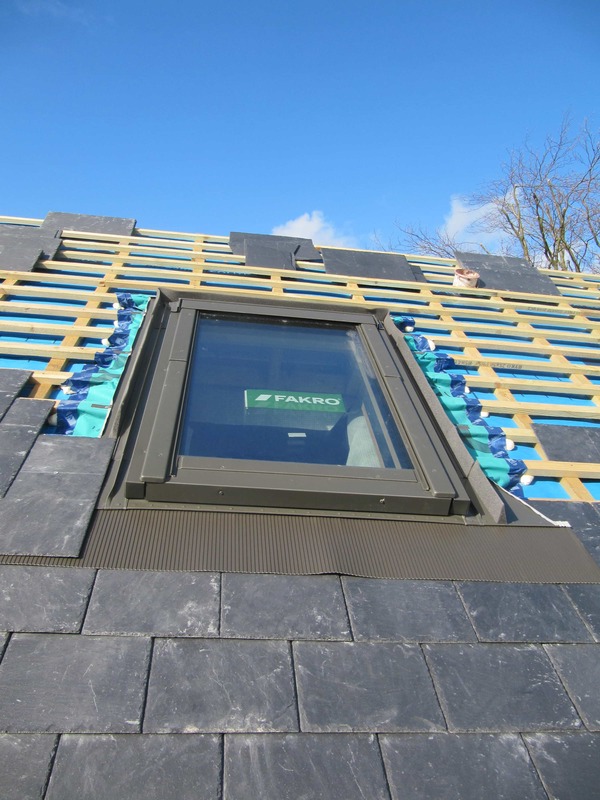 The problem with rooflights in a Passivhaus is that – due to the need for water and wind protection for the roof – you can’t wrap them within the insulation in the same way as windows & doors in a wall. You have to put the frame right into the cold of the outside of the roof. The thermal edge losses (Psi values) for rooflights are around 10 times worse than the wall window installation detailing at the house. Rooflights are always going to be a weak point thermally. But since the Golcar house is relatively large we can get away (thanks to modelling within PHPP) with using 3 rooflights. Thank you Bill for sharing this level of detail. It is really useful, and will hopefully help promote Passivhaus in the UK. Congratulations of the award for the Stirley project too. We built the Longwood House in 1991 with a 150mm masonry cavity post filled with blown Rockwool fibres. Even though we had been extremely careful with keeping the cavities clean of mortar, we were still anxious about whether the Rockwell had filled all voids particularly around cavity trays. It would have been good to take thermal images of the results but unfortunately we didn’t have the resources to carry out that sort of survey at the time. Cavity batts can give you some security of quality control. However, as with standard masonry cavity wall construction, mortar droppings, badly installed cavity trays and wall ties are the main cause of failure. Good workmanship is key.